#206 i might not have the right tools to fix that part. thursday, what are you doing in my house?! 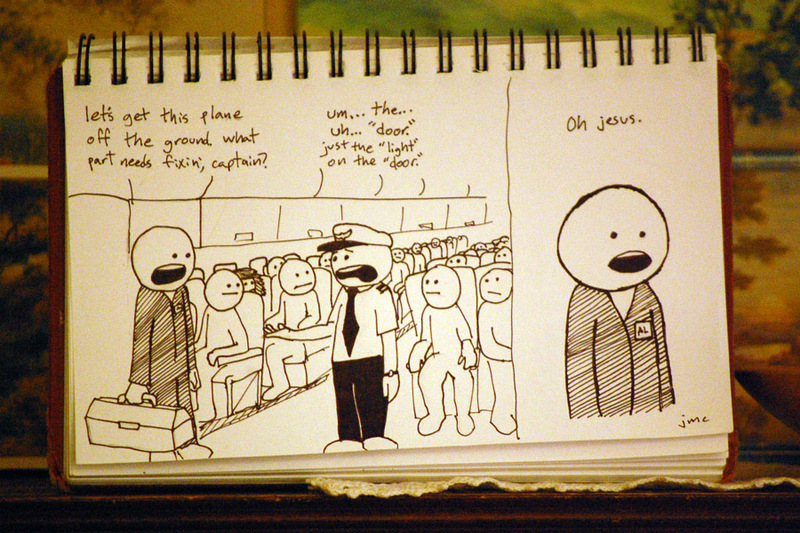 this is how all of the passengers on my flight perceived the problem with the door. i think it worked, but the light that said it worked did not work. does that make sense? i apologize for the roughness of this comic. i was outside when i drew it, and it was getting to be ‘dusk-ish.’ by the time it was done, mosquitoes were carrying off entire chunks of my flesh. i had ice cream today from an ice cream shop. i guess they still have those in other parts of the country. where i am from they have ‘dairy queen,’ and ‘coldstone creamery,’ and some very sad-looking ‘fosters freezes.’ but this place was not depressing or ‘corporate’ feeling. i guess if i had to make a political statement on this web site, it would be that we have an obligation to decentralize ice cream selling establishments. it is for the greater good of tastebuddies everywhere. anyway, i am feeling very sleepy. i think the constant, sweet drone of a billion crickets might have some sort of hypnotic effect. if i wake up and my room is full of them and they are all getting nasty in my suitcase, boy will i be pissed and confused. i hope your thursday shakes your hand and means it for god’s sake.